You can call us on 00 33 297 27 58 50 Or click here to contact us. We have been installing satellite systems for customers in the UK since 1987 and have encountered and resolved most problems that could be envisaged, giving us an extensive knowledge of digital satellite systems, installations and problem solving capabilities. Since opening in Brittany and expanding into Normandy, Mayenne and the Loire-Atlantique, we have been involved in the installation of more than 3000 digital satellite systems for both UK and French residents and have gained an excellent reputation for service, quality of installation and after-sales care. These are the three main points that we base our Company on. We truly believe that you, our Customers, are the most important part of our business and we undertake to do the utmost to ensure that you get the best service and guarantee. With the back-up support of a distributor who supplies all over Europe, we are now able to offer a comprehensive service including brand new latest design digiboxes, digital satellite dishes and all satellite accessories. We now have stock of the new FREESAT range of digiboxes, including the HD Freesat box and new Personal Video Recorders (PVR's). 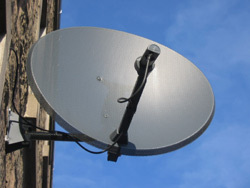 To watch English tv in France you need to have a satellite dish connected to a digital receiver (Sky Digibox or Freesat receiver) in turn connected to your television. The satellite dish needs to have a clear view of the south east (approximately where the sun is mid morning) and to be adjusted so that it points EXACTLY at the satellite which is about 22,000 miles away!. Accuracy of installation is paramount in receiving good clear signals, just half a degree off can mean the difference between a good signal or no signal at all! We have been involved with installing satellite equipment since 1987 and now cover Brittany, Normandy, Mayenne, Loire-Atlantique and areas of the Charente. We have contacts in most other regions of France to help you too. We're able to install our equipment for you using our very precise and accurate signal measuring equipment, alternatively, if you already have your own dish or receiver, we can install that too (subject to your equipment being serviceable and in good repair). Our customers have told us that when they have brought their zone 1 dishes (43cm) over from the UK, they have a lot of picture break-up in bad weather. So, due to the distance away from the “footprint” of the satellite in France, we always fit the correct size dish and wall mount for optimum performance. This is even more important since the new satellites, currently being phased in, have a footprint that is more focused on the UK. The further away that you are from Mainland UK, the larger the dish required for uninterrupted viewing.